National SUP Titles 2018 &ndash; Gold Coast. SUPWA would like to recognize the efforts of the WA Team ..
Ferocious racing mirrored the weather conditions at the Champion Lake Regatta Centre for the 2017 Starboard ..
2017 Paddlesports SUP 5000.. Four races held back to back from 2000m down to 500m, held at Deepwater ..
YOB Collie Bridge 5500... One of the most fun SUP events on the SUPWA calendar, held at Collie Bridge .. This has been confirmed. Registration 0700 for a 0730 start. Come down to Deep Water Point Mt Pleasant, it's a free event .. This event is back on the calendar. IMPORTANT NOTICE: A SUP Leash is required for this event. No LEASH, No Race. Event results .. Stand Up Paddling or SUP has its roots in Hawaiian surf tradition. This tradition was revived recently by modern big wave surfers, notably - Laird Hamilton, Dave Kalama and Brian Keaulana (to name a few) as an effective cross training tool. 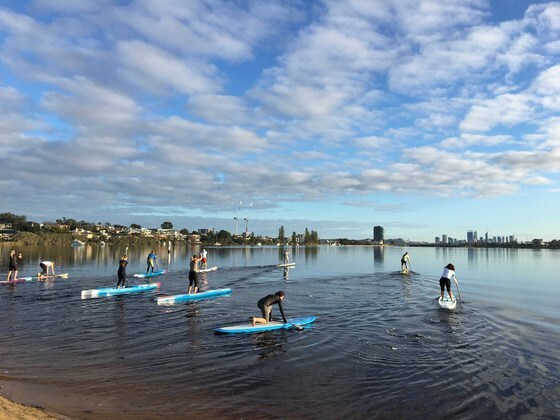 SUP is now one of the world’s fastest growing leisure activities and sports – People from 6 years of age through to people in their 80s and beyond are paddling. How Awesome! The Hawaiian tradition of SUP permeates the lifestyle. The Hawaiians refer to the "Aloha spirit", which is one of acceptance and kindness. This is further coupled with "Mahalo" which refers to gratitude and thanks. Whilst these are Hawaiian in nature and origin, they are the best words to describe the local SUP community and people involved in the sport worldwide. The SUP community in WA is all about the Aloha Spirt and the SUP Life is now being shared by thousands of West Aussies so Mahalo goes out to our Hawaiian friends. There are particular boards for each discipline, but there are many 'all round' boards that allow you to get into the sport and get a feel for the discipline that suits you. Check out your local shop to demo a board or take lessons. If you would like to get involved become a SUPWA member and enjoy the benefits of SUPWA and being part of a fantastic community of paddlers that are keen to share ideas and have fun.